Driving over to West Seattle before a podcast recording. 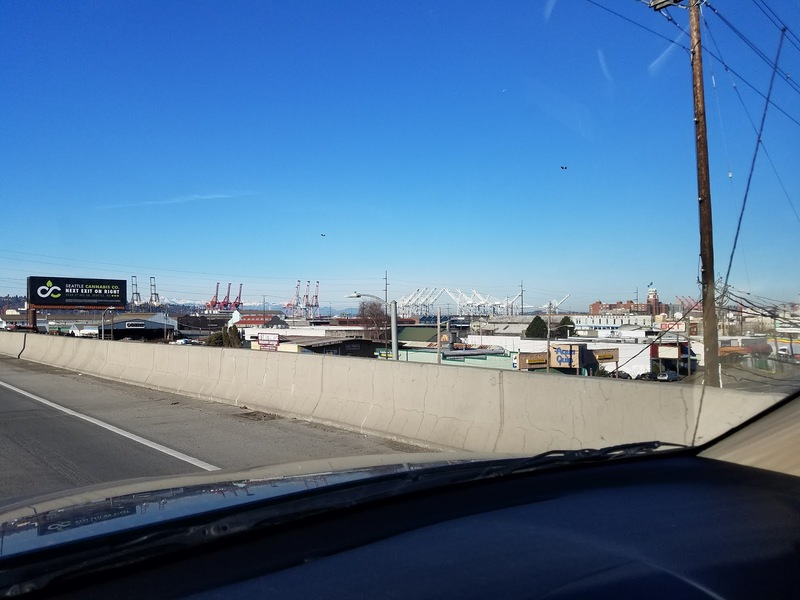 Beautiful, sunny, cold day in Seattle. Here's Shadowland from the south side. 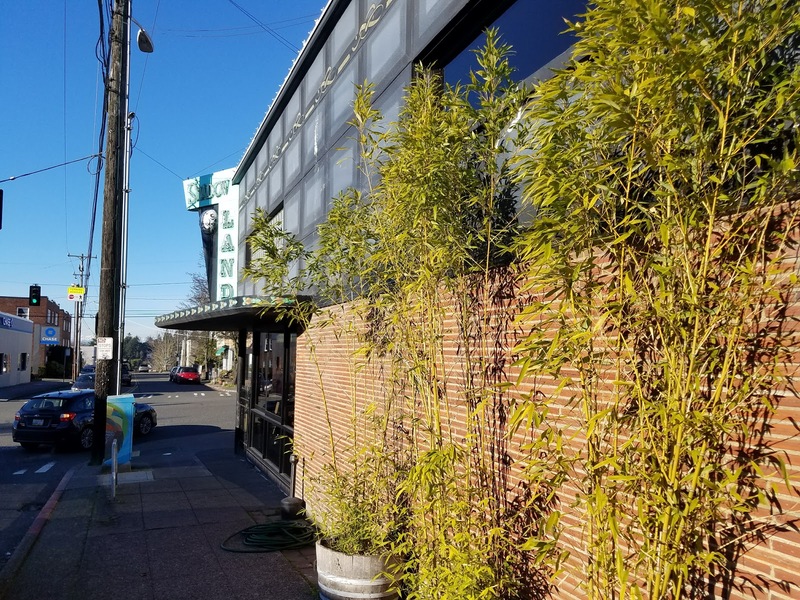 Bamboo and sun. 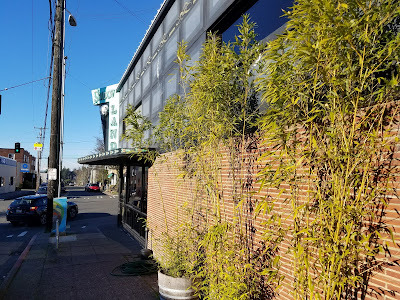 Feels like West Seattle. 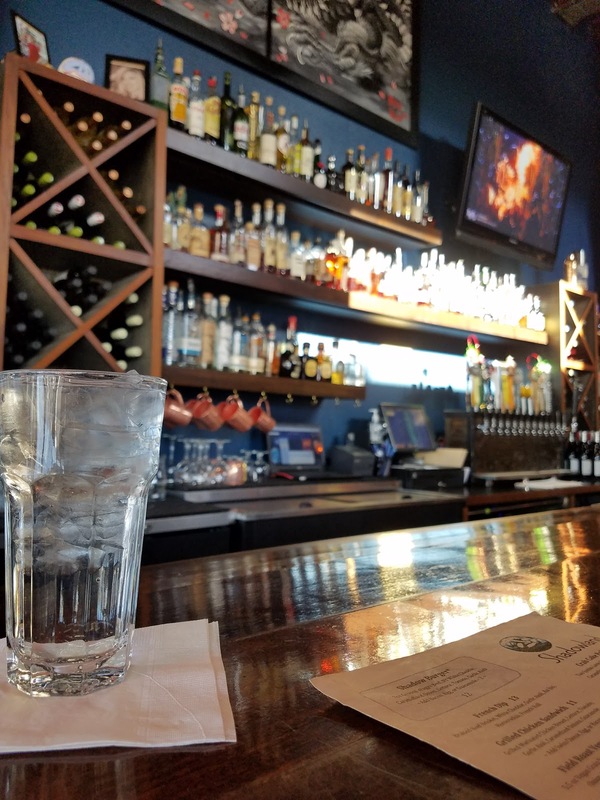 Their menu. It was a Saturday at about 11:30 AM. They had brunch and lunch options. 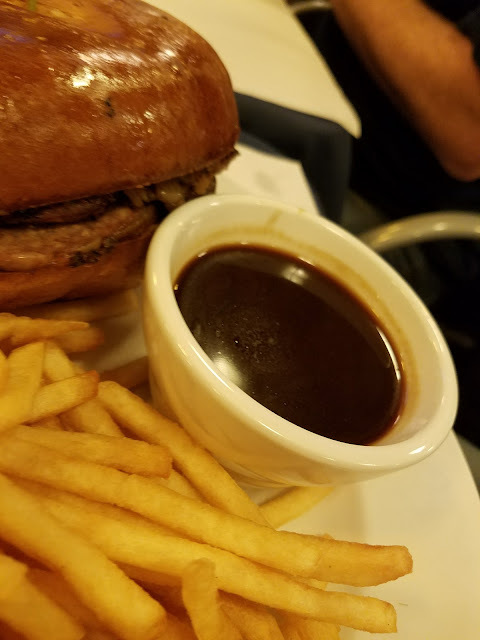 I wasn't in a brunch mood and was basically there seeking their French dip. Picture from the bar. My new Samsung Galaxy S7 has a way better camera than the S5 did. I upload all of my photos automatically to Google Drive using the Google Photos auto-backup feature. 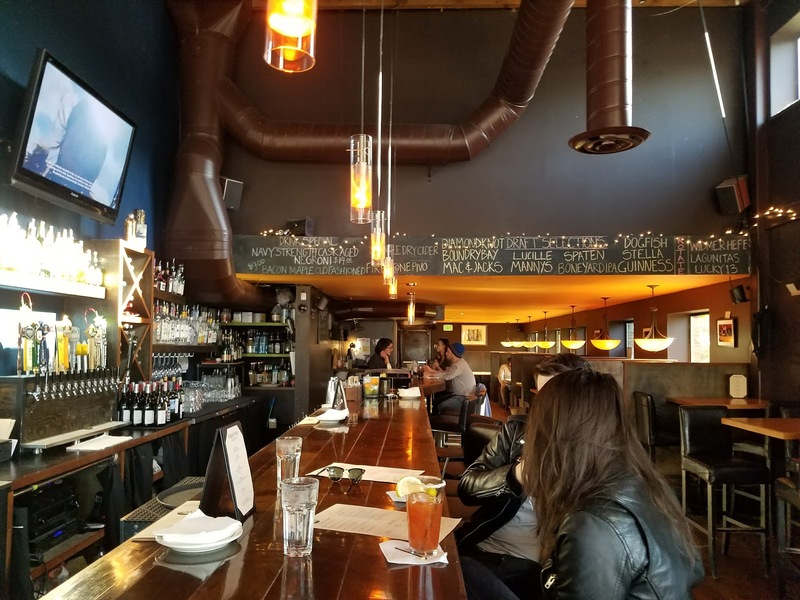 The bar. All of the wait staff was basically awesome. They were very friendly and nice. 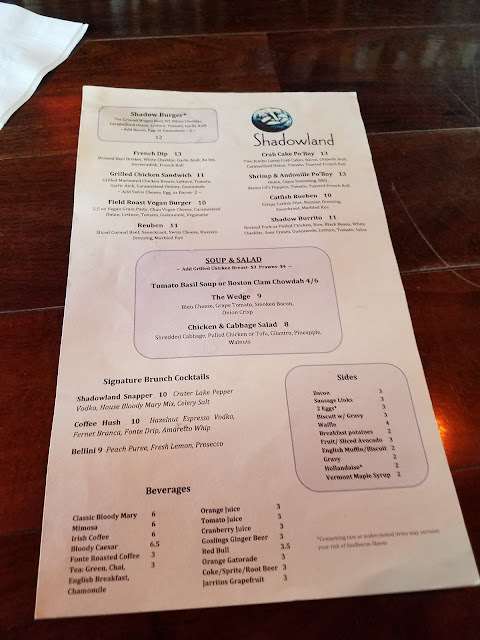 I asked about the history of Shadowland, which they readily and knowledgably disclosed. I guess it's been there for 12 years and was formerly a florist. 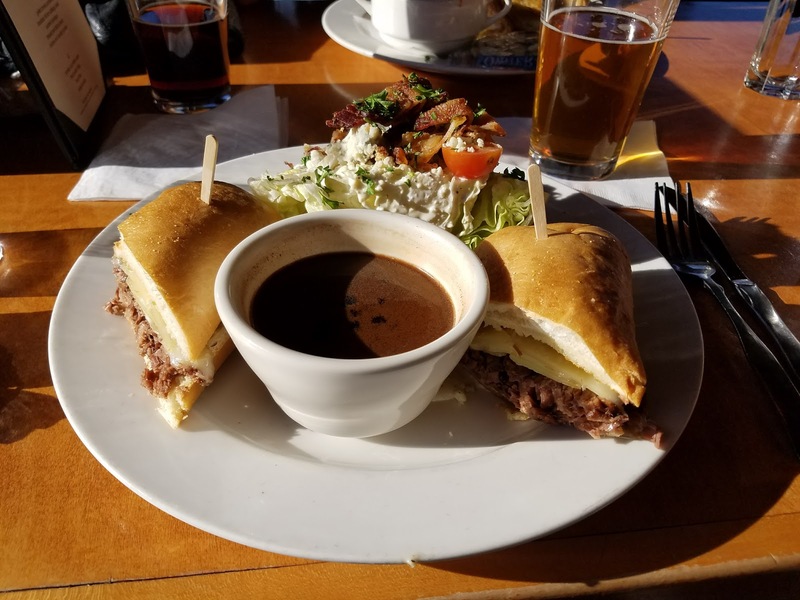 And I see the French dip. $13. 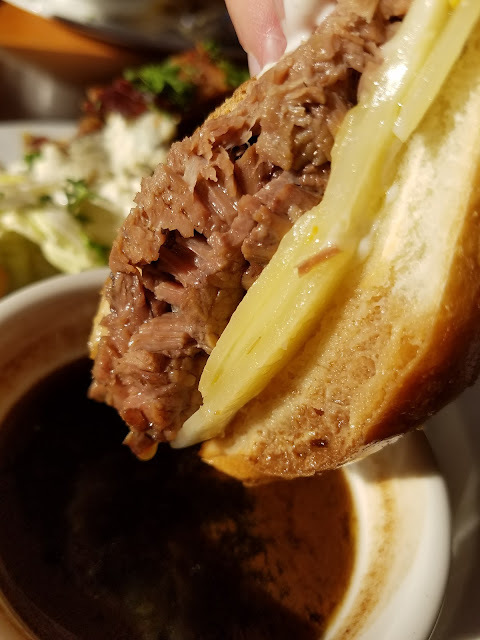 Braised Beef Brisket, White Cheddar, Garlic Aioli, Au Jus, Horseradish, French Roll. In the meanwhile, my wife and producer Christian showed up. We enjoyed beers and a seat in the sun. I really liked it in there and they played a lot of music from the early 70's so had a good vibe. Our waitress, Lauren, was extremely nice, warm, friendly, helpful, funny, etc. There's the sandwich. A few comments: the cheddar is not melted, so that's too bad. 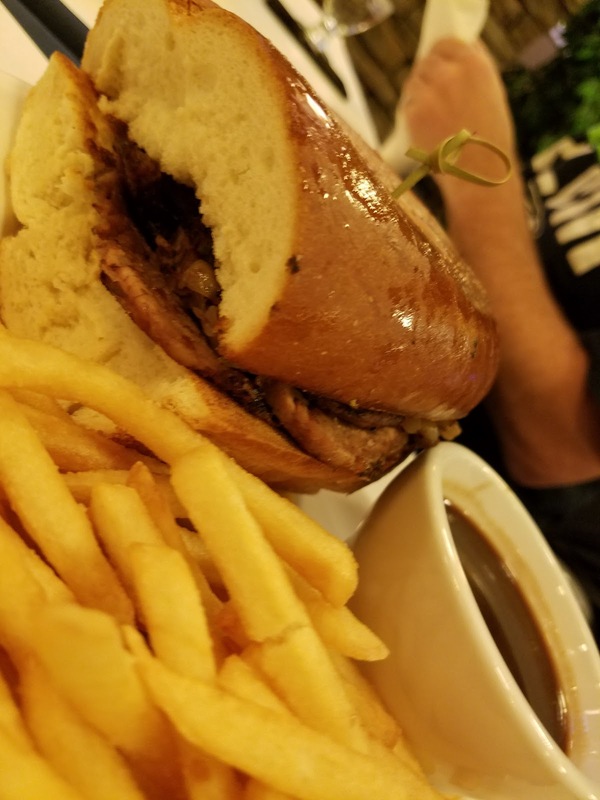 The bread is not too big nor does it look too fancy so I wasn't overly stoked. The beef looks fine and tasty. 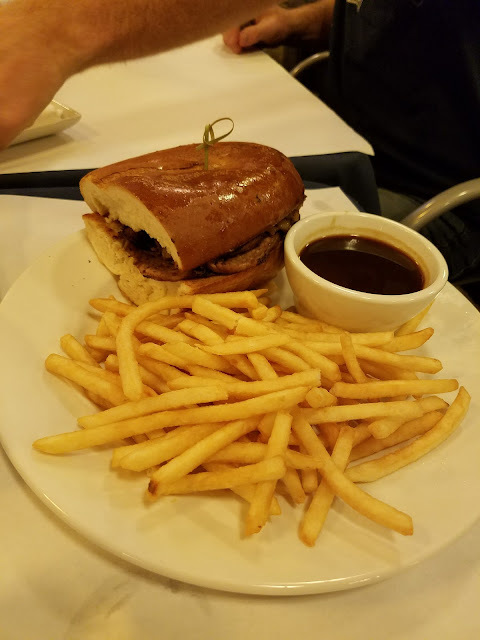 Here's the other side of the sandwich. Also cheese that is not melted. That could *perhaps* be resolved by a very hot jus, but that, my friends, was not my fate on this day. 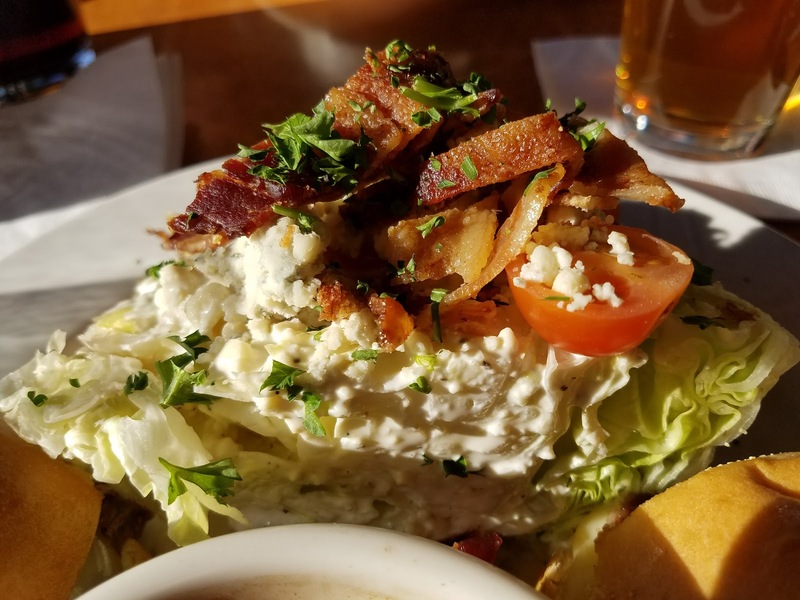 This wedge salad side gets bonus points. You don't usually (ever?) get a wedge salad as side option. And this was a good wedge. 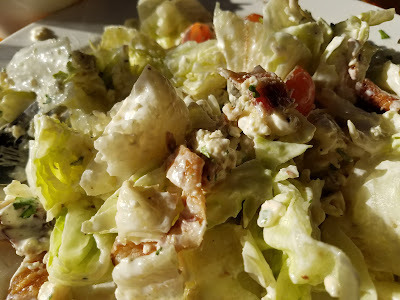 But I became overwhelmed by the creaminess of both the bleu cheese on the salad, the cheese and mayo on the sandwich. I will go on in more detail in just a bit. Here I am, about to punish this thing. About the jus: it wasn't to die for. It was dark and rich and stuff but it wasn't hot enough and just not remarkable. 3 of 5 for the jus. And back to this "creaminess" issue: you can see I had mayo on my finger; the problems had already started. Looks good. I am excited. The "money shot". Also looks good. But the aioli mayo killed and overwhelmed it. As I mentioned, it is a very nice feature when your salad blooms and becomes a second meal. This happened to me at Georgetown Liquor as well. The wedge was good. Not perfect but good. 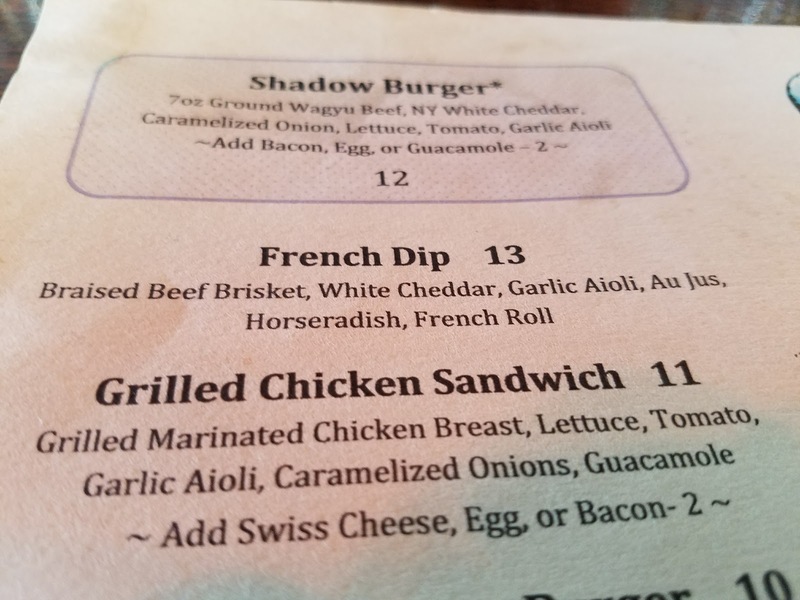 It gets a 4 of 5 because it's rare to be a side dish option for a French dip sandwich, but in the realm of possible wedge salads it is just average. More data for you on the wedge. Jessica got a chicken sandwich with a salad of arugula on the side. 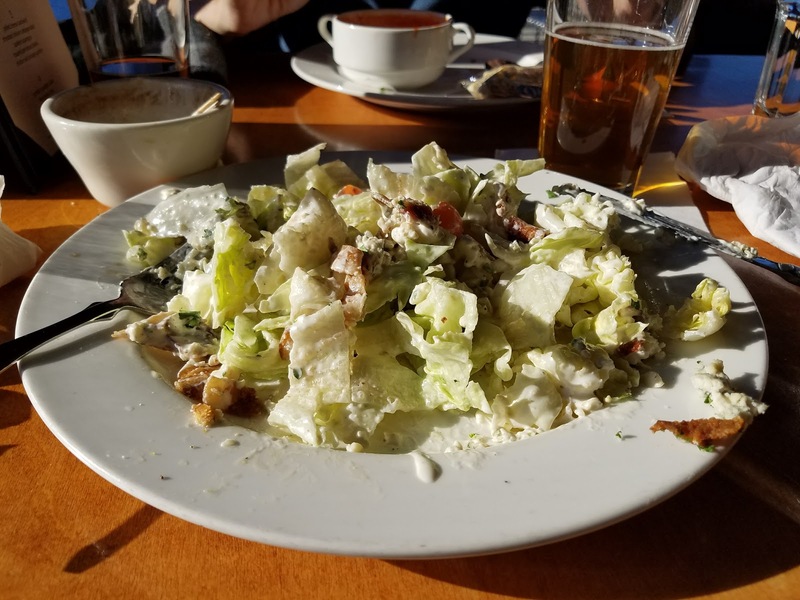 Very lovely salad and she said it was great. 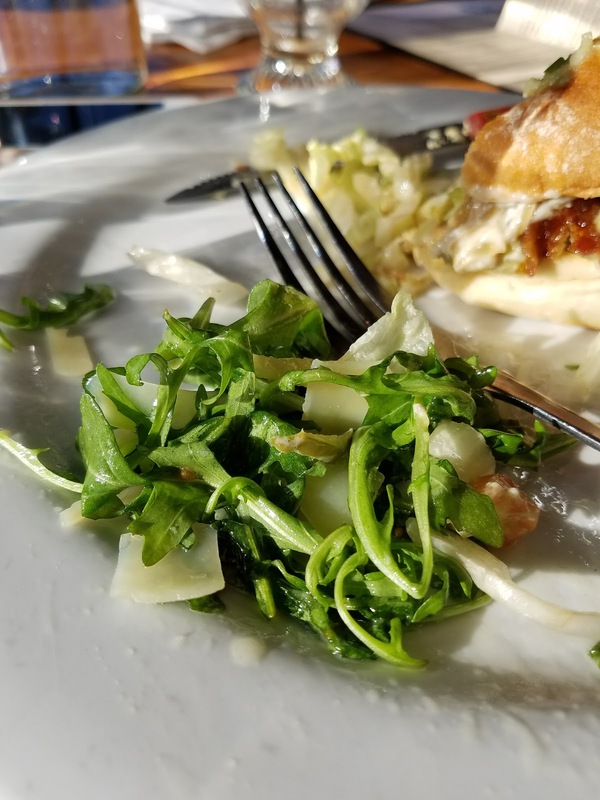 She preferred the salad, by far, to the sandwich, which was also what happened to me. 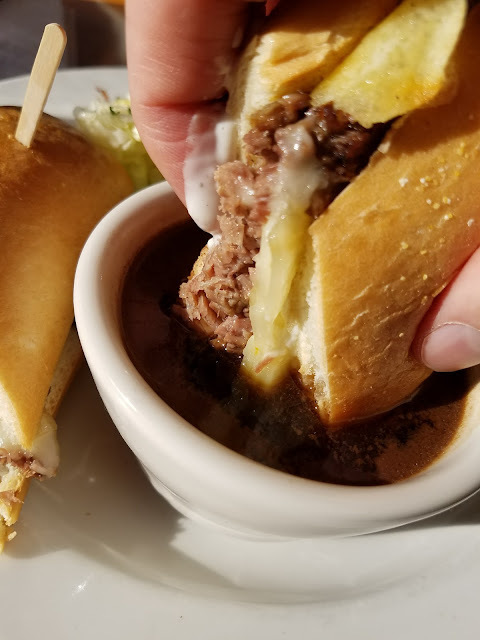 As I ate and photographed and took notes and fully immersed myself to the sensation of the French dip, Jessica and Christian, who were meeting for the first time, chatted. It was good overall but not great. 3 of 5 overall. The size was basically small. 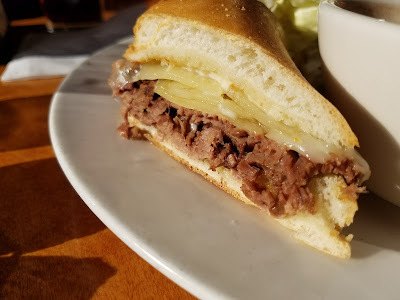 It had a lot of cheese on it, a fair amount of beef, fairly small bread area. Neither the sandwich nor jus were hot enough. I was at least one IPA into the meal at this point. I made a huge mistake and did not request for the aioli to be on the side. I had made this decision before but ordered in haste. 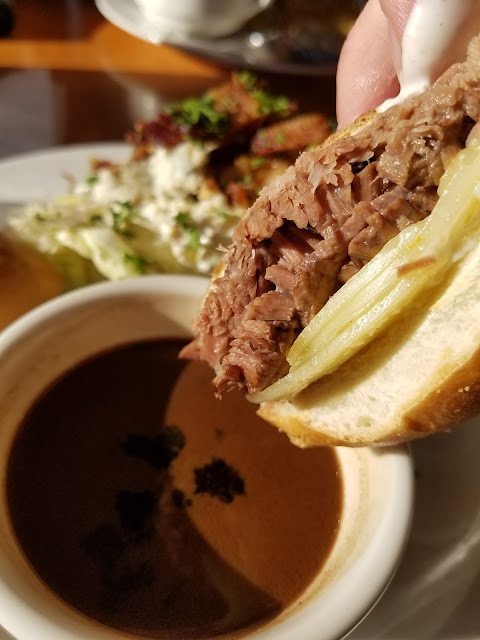 It is a rule to never get the aiolio on the French dip. 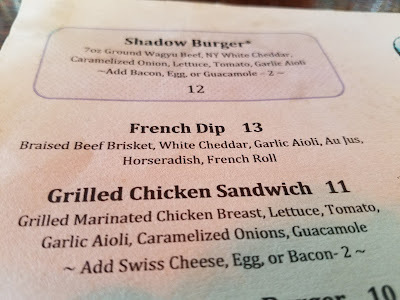 The sandwich had a 3 in flavor. Nothing really to write home about. The horseradish flavor was not memorable either. And it wasn't on the side either, so I couldn't overindulge in it. You want spicy Beaver horseradish not in the cream variety. The bread was small and classic so I'm only going to give it a 2 in this context. 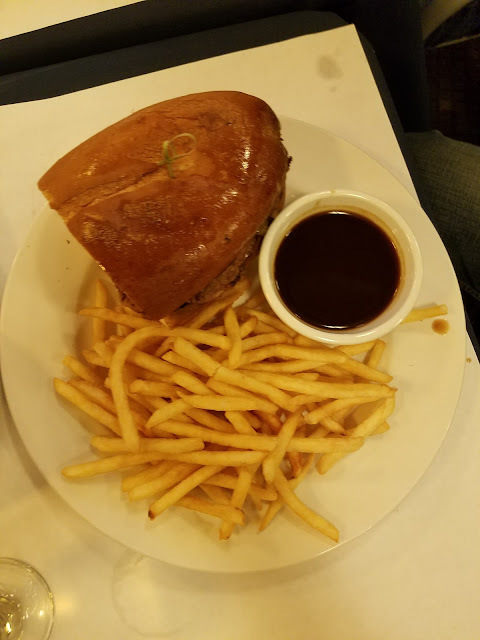 Beef was fine but also not notable. Jus was fine, also unremarkable. And I come back to the salad, which was actually the highlight of this meal (not to mention the Fishhead IPAs). It was a good wedge probably 4. 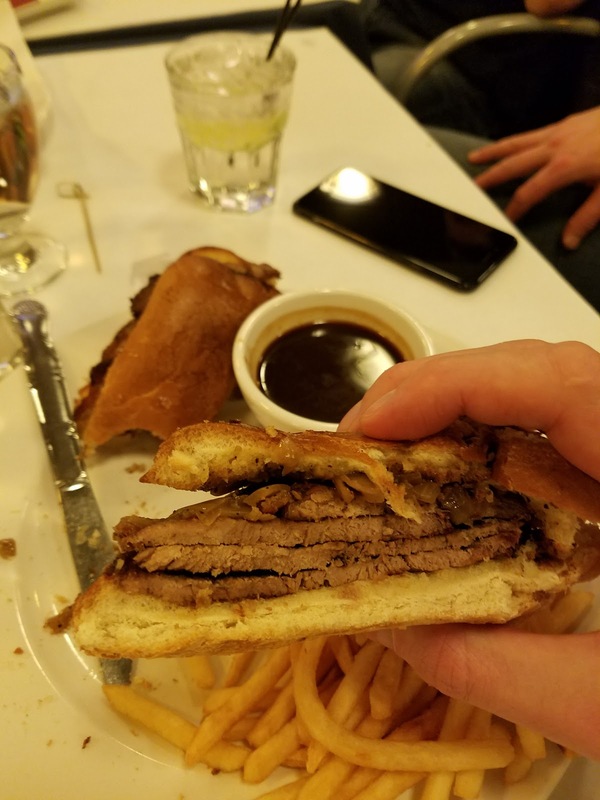 I wasn't overly impressed with this French dip. At its most basic, it was too creamy. It didn't need all that mayo and cheese. 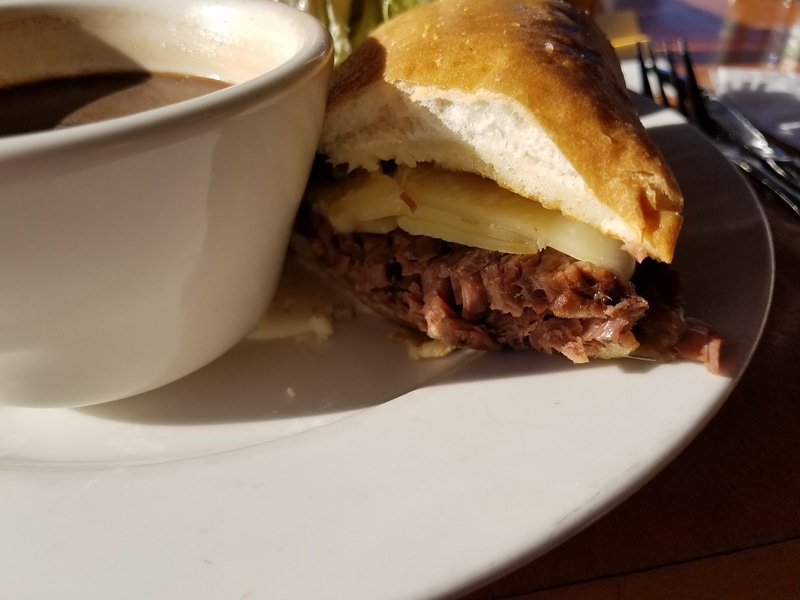 French dips should be a simple food and if you are going to gussy them up with a bunch of other stuff, choose very wisely. And don't think that aioli tricks anyone beyond mayonnaise. I gave all of this feedback to the waitress which of course overwhelmed and cracked her up.